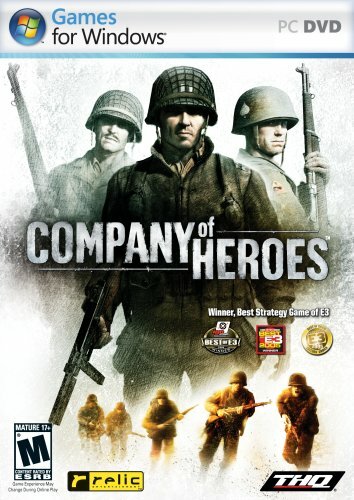 Players need to have a ‘tip top’ computer system (especially a high quality graphics card) to run this amazing, intense PC World War II action/strategy game from THQ (DirectX 9.0c is required). The amazing detail and destructive options set this game apart from similar military titles and any other action/strategy. Military fans get some standard historical events like the invasion of Normandy, all in European settings, but any video gamer can appreciate this game. There’s always a lot going on and a lot of things you can do about it! Initially, this game might become overwhelming, especially if you’re not familiar with the genre type, but don’t worry too much – there’s a tutorial, performance enhancers and plenty of learning experiences. The beginning time investment will be fairly high, especially if you want to be successful to begin battles in the multiplayer/online modes. Once you settle in, take notice of the power levels and capabilities, so you can make informed decisions on the battlefield to get that competitive edge. Players can get an extra edge by acquiring/destroying elements and utilizing the options at their disposal. Get strategic points to increase the rate of manpower, which creates a nice overwhelming element. As players control more territories, their population cap (maximum number of units allowed) increases. Promotion and veteran status can also improve performance. Don’t get too dependant on the numbers game though, it’s just fun to attack no matter what the situation is, just to see what happens. More profound elements involving vehicle fuel, flamethrowers, engineers, pinning enemy squads and, gulp, body parts sets this title apart in a flooded military genre. You can also acquire points through the company commander system where the Allied forces have infantry, airborne and armor while the axis has defensive, blitzkrieg and, of course, today’s quintessential evil – terror. The Axis forces have more interesting weapons including a rocket battery that emits a pretty creepy sound. The overall sound is great and the camera work impresses, except for a few camera views that are a bit too close. A high replay value for the variety of strategic scenarios and deep environments, which can translate into several replays ion the single player campaigns and endless multiplayer/online challenges. This highly recommended (***1/2) game provides endless entertainment and is rated M for intense violence, strong language and blood and gore by the ESRB. Collector’s Edition and wireless version also available. This entry was posted in Video Game Reviews and tagged Company of Heroes, Michael Siebenaler, Mike Siebenaler, Tall Writer, video games. Bookmark the permalink.